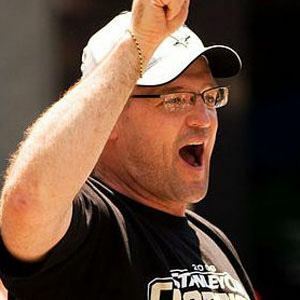 Former NHL player who became head coach of the Pittsburgh Penguins, leading the team to a Stanley Cup Championship in 2009. He was hired as head coach of the Buffalo Sabres in 2015. He played right wing for the Los Angeles Kings and the Mighty Ducks of Anaheim. The Penguins went to the Stanley Cup Finals in 2008, but they lost to the Red Wings. The following year, after Bylsma took over, the team got revenge and beat the Red Wings in a classic 7-game series. He married Mary Beth Bylsma in 2001. He coached Sidney Crosby from 2008 to 2012.